So I've gone through several bikes over the past few months, some of them accidental acquisitions, and others just trying to find that right tool for my toolbox. 09 KLX250SF Supermoto. Only 2700 miles. Had been parked and forgotten about for a long time. Was sorta kinda running when I got it, but not really. More like being in a deep coma with a very faint heart beat. It is now wide awake and ready to ride, except.... those tires. Despite looking like new, they're original and 9+ years old. Tire threads are almost as bad as oil threads, and I know I'm gonna regret this, but.... I'm looking for opinions. I want an aggressive tire that will grip in GRASS, and do a decent job off pavement (think RRG, DBBB & KAT), without sacrificing too much pavement performance. I do not want to change out my wheels. I like the 17" rims and plan to keep them. There lies the challenge. Front is a 110/70-17 and rear is a 130/70-17. Selections in a 110 are limited, and getting a tire that fits my needs is quite difficult (been there, done that). I'm sure there will be a few that will balk at the idea of going with a 120, but that's what I'm going to do. Not only that, but I'm probably going with a 140 rear as well, for multiple of reasons. Right now, I think the most logical choice based on my wants/needs, is the Continental Twinduro TKC80's. Available in 120/70-17, 130/80-17, and 140/80-17. I have some experience with the TKC80 and have always felt that it was an exceptional tire on the pavement, but with that big block pattern, hopefully it would provide the off pavement bite that I need as well and allow me to keep up with a very fast KLX140L without hurting myself (is that even possible?). I thought about going the cheap route with a set of Shinko 705's, but I don't care for the taller profile of the front size(s) that are available, nor do I think the tread pattern of the 705 is aggressive enough for me. I know there are other tires out there, but those meeting my needs in the sizes that I need, tend to be quite expensive. Is there something out there that would work better than the TKC80? I was eyeballing those at one point. I like the thread pattern, although I'm not sure how well they would perform in the grass (I think the TKC80 would likely have more bite). Doesn't really matter though. The smallest rear is a 150, and I think that's too much of a stretch. ....well, that and the fact that a set would got me about $315. Hehe... good suggestion though! Nice KLX! I had one just like it and had good times running the Shinko 244s and a 48t rear sprocket. I never got into much mud, but they did good otherwise. I had the Shinko 244 'Golden Boys' on my Baghira for a short while, and actually liked them quite well with the exception of tearing a couple knobs off the back tire in some high speed runs. I would consider running them again on the KLX. 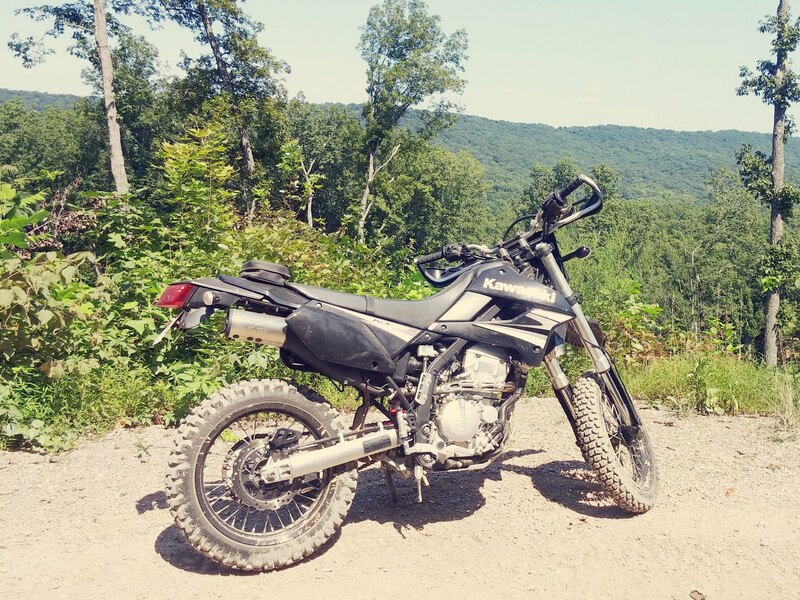 Ironically, I stumbled upon a KLX250SF on CL this morning, that is running the 244's as well. So that's twice now. I overlooked those before. I'm not sure why. Maybe because I was struggling to figure out the right sizes. I can see from your photo that you were running a 4.60 rear. Do you recall what you had on the front? 3.00 maybe?